Four Robert Juliat Lancelot 4K HTI followspots took front-of-house at Brazil’s Rock In Rio Festival this summer. Held over two weekends at the Cidade do Rock at Rio de Janeiro’s Parque Olímpico da Barra, thi festival saw headliners Aerosmith, Guns ‘n’ Roses, Bon Jovi, Maroon 5 and the Red Hot Chili Peppers play to over 700,000 during seven fantastic nights. 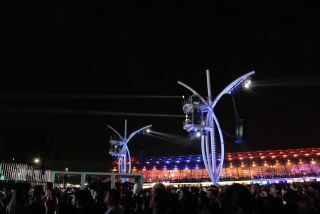 The Lancelot fixtures were rigged in full view of the audience on stylish, modern lighting and sound towers - designed for minimal impact on audience sightlines and to give a real architecture to the festival site on the aerial camera shots - which arched gracefully over the enormous crowds that make up one of the world’s largest music festivals. The huge throw distances and equally big names on stage called for the precision and finesse of Robert Juliat followspots to illuminate some of rock’s greatest bands in front of the massed fans and television cameras.